It's time for me to make a confession. I know fluency is super-important, but I rarely made time to truly focus on this critical reading skill. I didn't blatantly choose to ignore the skill (fluency activities are usually FUN, after all!)... I simply ran out of time. So many of my upper elementary readers were still needing help with vocabulary development, decoding, and comprehension that my time would tick away focusing on those skills. Has this ever happened in your classroom? 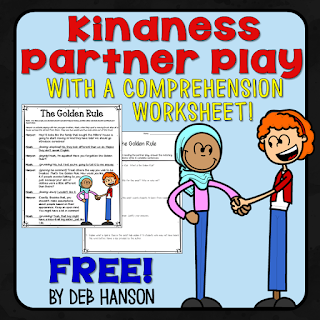 One day last spring, my then-first grade daughter came home with a partner play. Her teacher implemented Daily Five, and Brooke was telling me about how she and Morgan read it during "Read to Someone". Brooke and I read it together, and I was surprised by how fluently Brooke read the script. She was full of expression! Plus, it was fun. 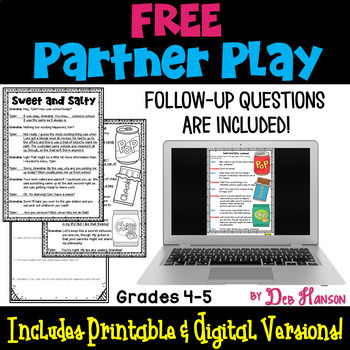 That got me thinking... maybe I should create a partner play pack for upper elementary students! 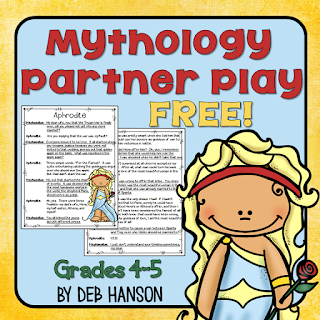 I started with a 2nd-3rd grade bundle, and I had so much fun writing them that I went ahead and created a 4th-5th grade bundle over the summer, as well! My daughters, Kayla (now a fourth grader) and Brooke (now a second grader) actually looked forward to reading the scripts with me!! It was a win-win situation! They were having fun getting some summer-reading in, and I was able to check the readability of my partner plays. Believe me, they both had plenty of feedback for me, too! Once Kayla told me, "Mom, fourth graders don't use that word." Here are the finished bundles, although I also have mini sets of 5 available in my store, also. (Set 2 for grades 4 and 5- focusing on more reading skills like character traits and figurative language- can be found HERE. One of the things I like most about partner plays is that they need very little teacher support! Busy teachers who need to spend time working with students on comprehension, decoding, and vocabulary can continue to do just that without feeling guilty that they are missing fluency. 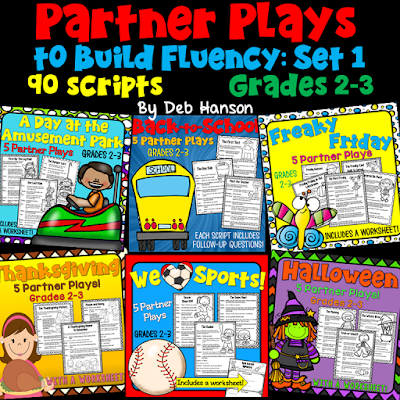 My classroom vision is that teachers could introduce partner plays by conducting two minilessons with the entire class at the beginning of reading over two consecutive days. During Minilesson #1, I would introduce the partner plays by showing a script using the document camera. Then I would invite a student to model with me how to read the script. When we had finished reading the script, I would ask students to create an anchor chart with me of what Partner Reading should look like and sound like, asking them to keep in mind that I will be working with small groups like normal. If necessary, I would help them come up with phrases for our anchor chart like "two kids sitting side-by-side", "quiet voices", "giving strategy suggestions to help classmates read a difficult word", etc. 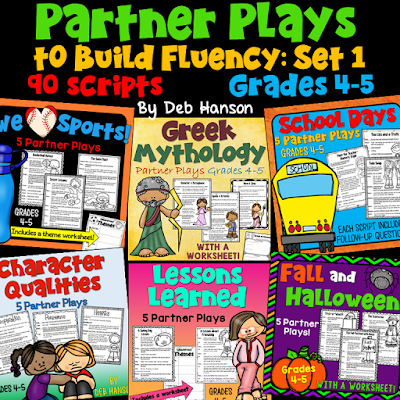 During minilessons #2 and #3, I would tell my students that the reason we are reading these partner plays is to focus on fluency. 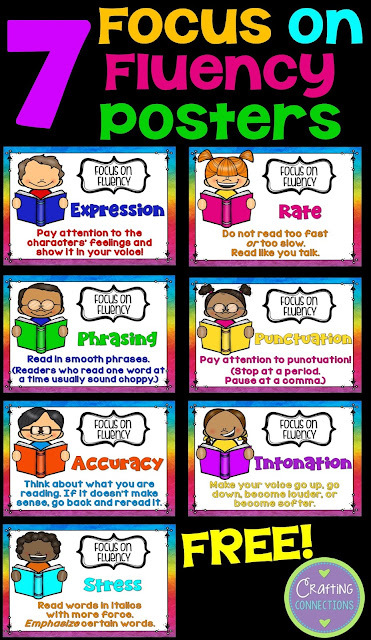 Then I would show them these fluency posters (freebie!) and discuss each component of fluency individually, modeling examples and non-examples. Click on this image to access the 7 posters, PLUS bookmarks and an interactive notebook entry! I hope you will give the free partner plays a try in your classroom! If you do, please leave feedback and let me know how it went! These are different than the ones from last year. Did you update them?